In late 2011, after building several wooden kayaks for his own personal use, Chicago-based Director of Photography and longtime hobbyist Kimmer Olesak stumbled across yet another woodworking craft that would soon become an obsession: Cigar Box Guitars. He quickly began stockpiling every cigar box he could get his hands on, sourcing them from wherever he could. His first guitar was born shortly thereafter: a six-string masterpiece made from a classic, single-flap cardboard cigar box with a hand-carved richly grained cherry wood neck. As word spread and demand grew, Kimmer's building took off. He began experimenting with three-string guitars, electric pickups, and using other found objects, like oil cans, vintage metal lunch boxes, and anything that would lend itself to intriguing design and incredible sound. The result was a collection of guitars unlike anythinganyone had ever seen or heard before. Folk and bluegrass musicians were awestruck that such a small and delicate instrument was capable of producing such a unique and powerful sound. Quickly, Kimmer's creations became staples in their rotation of instruments. The guitars continue to flow out of Kimmer's woodshop, each one meeting his impeccable standards of craftsmanship, beauty, and functionality. They are truly an American-made original. 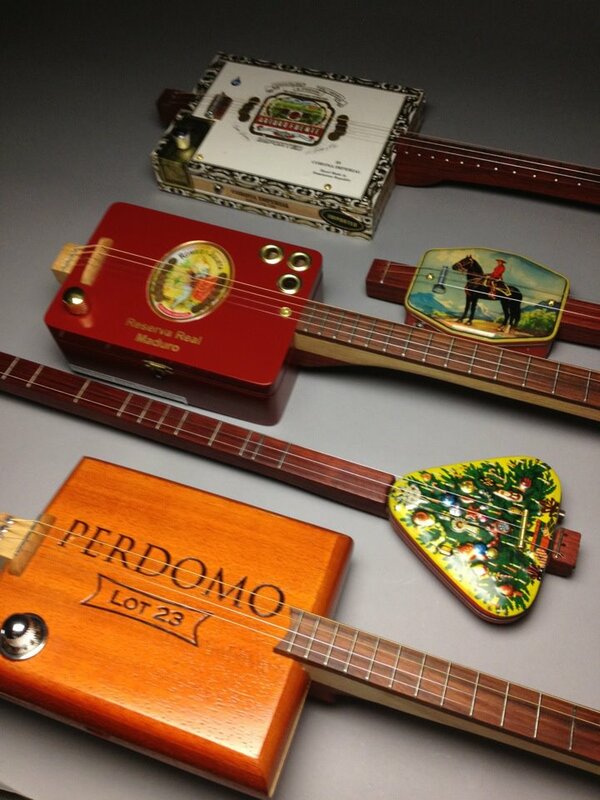 All of our guitars are handcrafted from found objects and the highest quality custom materials. We have a rotating selection of already built guitars at our shop, as well as an expanding collection of vintage cigar boxes and unique containers you can select from for the guitar of your choice. Custom consultation for a guitar crafted from your own found object is also available. Click the link at the top of this page to visit our online store and begin shopping for your AxBox.